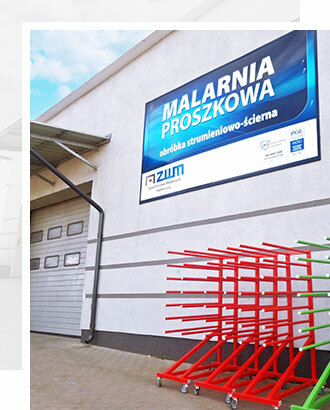 Powder coating plant - EN - ZWM Dojnikowscy Sp. J. Our company operates one of the most modern powder coating plants in the region. Which from July 2011 allows us to create products of excellent aesthetics and strength. The project was implemented and financed thanks to European Union funds and our own contribution. Our powder coating plant uses advanced surface treatment technology and powder coating. We offer cleaning and painting of steel elements up to 9 meters long. When performing the tasks we commissioned to, we reach for the best quality paint which exhibits high resistance to atmospheric agents. This gives you the confidence that the coating effect will really last. Using this process also gives the possibility of giving aesthetically pleasing appearance and protection against the harmful effects of rain, snow and other external factors, as well as mechanical damage. Powder coating guarantees anti-corrosion protection of products and also a 100% use of material, which results in lower costs. In our powder coating plant we use the latest and most effective mechanical solutions. The technology we use gives us products stand out with appearance and perfect coverage. In addition, our powder coating appliances allow us to apply paint on various types of elements. We choose modern and verified solutions, so our powder coating plant is known for the highest quality services and attractive prices. We guarantee our clients timely execution of orders as well as individual approach to each task commissioned.